Micro Boats are 3.5-inch miniaturized motor boat toys that can really race around. These motorized racing boats can reach a scaled speed for their miniaturized stature of 200 miles per hour which would be the equivalent of how fast they could travel if they were at real life size. 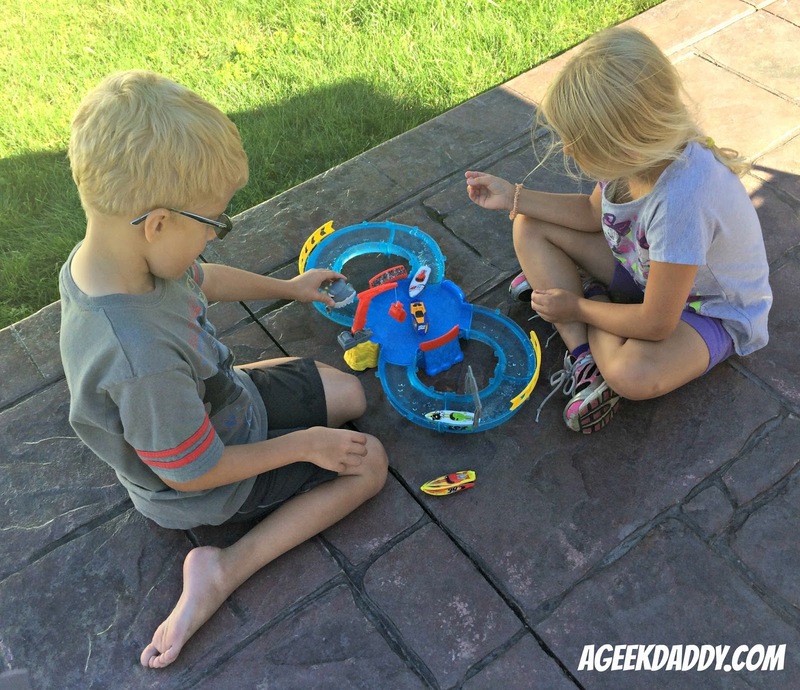 My kids have been playing with them quite a bit since ZURU Toys sent us a few to try out and have really been enjoying themselves racing these Micro Boats. 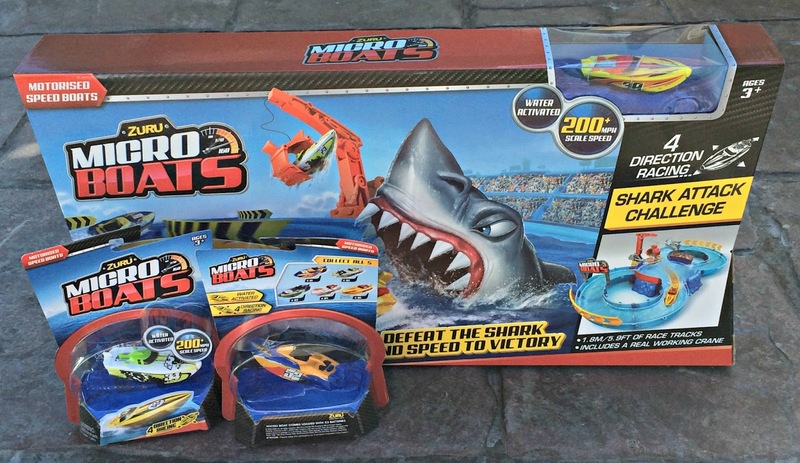 There are five differently decorated Micro Boats to choose from; four are packaged and sold separately while another one is included along with the available SHARK ATTACK CHALLENGE race track set. In addition to a Micro Boat, the toy set provides nearly 6 feet of track allowing for structured play and racing anywhere indoors/outdoors you want to set it up. It also includes a crane that can pull boats in and out of the water and a giant shark head that can try to take a chomp out of passing racers as they go by. The Micro Boats activate when they come into contact with water which gets their propellers spinning. Dry off the bottom of the boat and it turns off. The toys also have a battery saving feature that shuts the boats down after a few minutes of continuous use. Each boat is powered by 3 replaceable coin cell batteries which the included instructions advise should provide about 1.5 hours of cumulative play time. 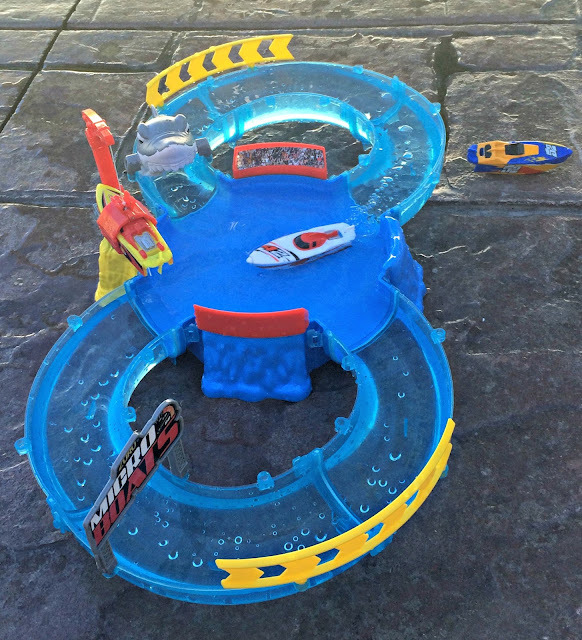 My kids enjoyed a week of quality play both using the race track and taking the Micro Boats into the bathtub with them before battery drain began to slow the toys down. 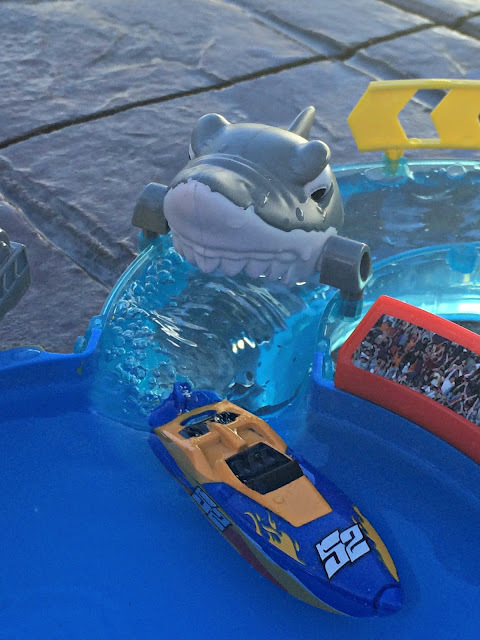 While the SHARK ATTACK CHALLENGE race track provides a nice space for playing with these toys, especially for younger children, you'll get the optimal experience from Micro Boats when they are used in a bathtub or backyard pool. 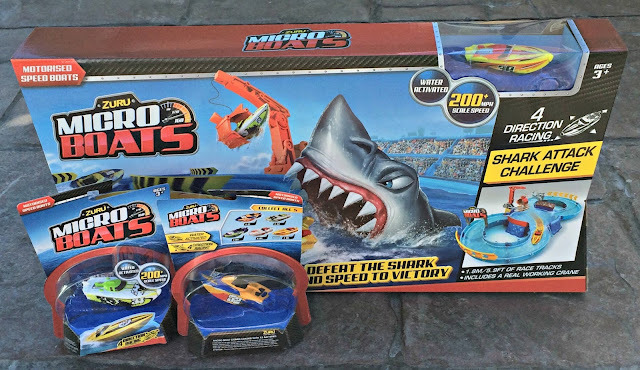 These toys really picked up some speed and were better able to use their 4 direction racing abilities when they had some more open space to move about compared to the more restrictive water filled racing track provided in the SHARK ATTACK CHALLENGE. 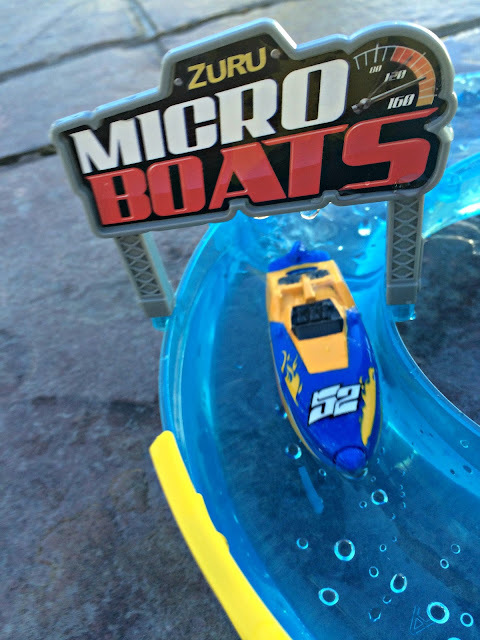 Micro Boats are equipped with sensors so that being hit on either side by another boat or a barrier will trigger a 360 degree spin, bumping the front will cause them to traverse in reverse, and knocking the back will get the toy racing forward again. The four directional movement aspect of these toys provide an extra element of fun to the Micro Boats racing experience. The impressive water activation function, nicely decorated racing boat designs, the four direction racing features and the uniqueness of the toy earn Micro Boats from ZURU Toys a nod of approval from A Geek Daddy. Whether you are looking for a holiday stocking stuffer, a bath time toy, or something to amuse your children on a summer afternoon, Micro Boats are a great pick up that will surely excite the recipient whether it is a kid or a kid-at-heart.